A "substantial reward" is being offered for information about "valuable and culturally significant" Chinese art stolen from a Cambridge museum. 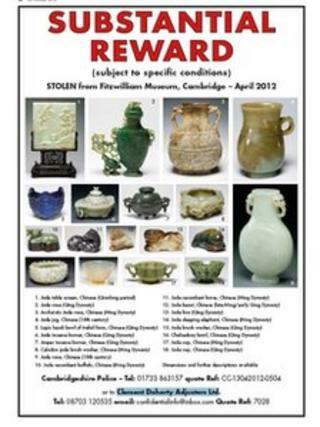 The 18 mainly jade items were taken from the Fitzwilliam Museum in April. Three men and a 16-year-old boy were sentenced on Thursday, but police still do not know where the stolen items are. Loss adjusters Clement Doherty Adjusters Ltd has placed the full-page advert in Antiques Trade Gazette on behalf of the museum. The advertisement does not state how much the reward is. The items, dating from the Ming and Qing dynasties, have been valued at between £5m and £15m. They include a jade 16th Century carved buffalo, a carved horse from the 17th Century and a green and brown jade carved elephant. Roger Keverne, a London-based dealer who specialises in Chinese ceramics and works of art who advised the museum following the theft, said he was hopeful the reward would lead to the return of some or all of the items. "Although the advertisement does not say how much the reward is, I expect if someone rings up with information, they will try to open up negotiations," he said. "The more people are made aware of this, the better. "It will make it even more difficult to sell the haul and I hope someone will do the right thing, return the art for the reward and then it can be taken back to the Fitzwilliam." A spokesman from the Fitzwilliam Museum said: "We see the advertisement as part of the second stage of the investigation, entailing the return of all 18 stolen jades to the museum." On Thursday, Steven Coughlan, 25, of Gypsies Residential Site, in Eleanor Street, Bow, east London, Robert Smith, 24, of Rosedale Stables, Swanley, Kent, and a 29-year-old man from London, who cannot be named for legal reasons, were each jailed for six years for conspiracy to burgle. Marvin Simos, 16, of Hanameel Street, Victoria Dock, London, was sentenced to a four-month detention and training order after admitting burglary.